Badminton is perhaps one of the most complete sports in terms of fitness, sharpness and ability. Having a sharp game and being able to perform at the biggest stage in expected of every Inter IIT team but the amount of hard work that the team puts into fitness is commendable. Their fitness regime is so intense that they could be sometimes seen spending more hours at the Institute stadium than the Athletics and Football teams in the early part of the semester. The captains have remained unchanged from last year with Monika Bhukya(Moh) leading the women’s team and with Soham Parikh leading the men’s team. 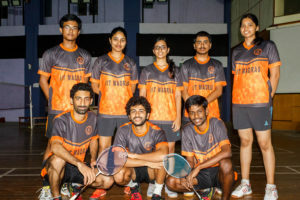 The women’s contingent includes Tanya Agrawal and Surya whereas Vinyl Kiran, Srinidhi Bhat, Nipam Basumatary and Vignesh form the men’s contingent. Other than the first year students, the team has been together for a long while since even the team freshers who are in their third years have been regularly practicing with the main team from their fresher year. This has ensured bonding among the A and B team players to a great extent. Both teams agree that the practice sessions were intense but they are glad it was this way since it has helped them in achieving much greater fitness which in their words, enables them to maintain their A-game throughout the match, with fatigue not getting the better of their game. 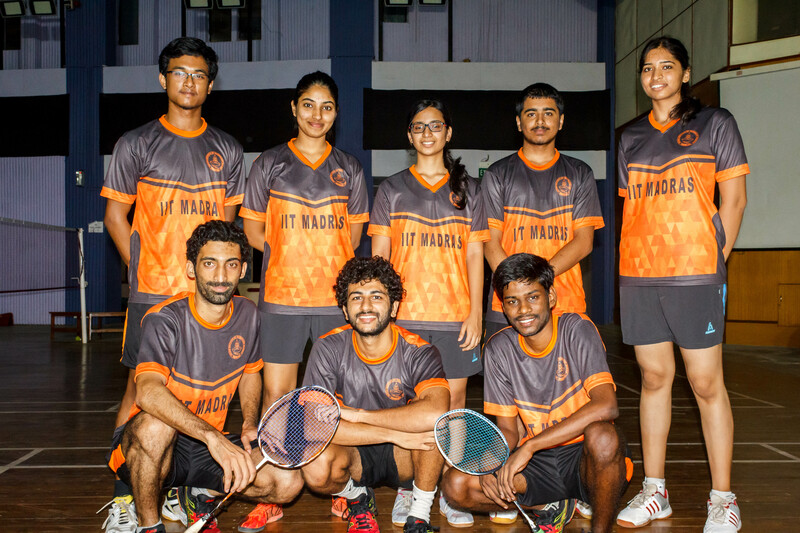 The badminton has consistently contributed to IIT Madras’ GC charge and they are set to do- as commentators say- more of the same in this edition as well. Soham and Mounika have been inspirational throughout this year receiving nothing less than a 9/10 from everyone on the team. From sincerity in building fitness to playing with supreme prowess, they both have led by example. Their cooperative nature and their success in bridging the gap between the players, especially the new ones, and the coach has been phenomenal. The coach has had a gargantuan effect on the team. Intensive gym sessions, fitness sessions and numerous hours on the court have ensured that the entire team can sustain their game for the entire duration of the game without giving way to fatigue. Performance on the match day and playing in the chilly weather of Kanpur is going to be a big challenge for the team. Adjusting to the climate would be key, because the body needs to be able to feel at home before it can give its best. Vinyl believes that continuity of the practice sessions is of immense importance and to have regular practice sessions during the even semester would do a world of good since it would help keep everyone at the top of their game. Team captain Soham believes that a pep talk to rally the troops on at the start of the main camp would serve as an ideal to start to GC winning campaign. The team says that it has just one goal and that’s to win gold. That’s the reason why it thinks the most fitting motto would be, “Win gold, nothing else”. T5E hopes all the practice pays off and the team comes back victorious.